Welcome back! I wanted to post my card for the Color Throwdown and Stampin' Royalty challenges. 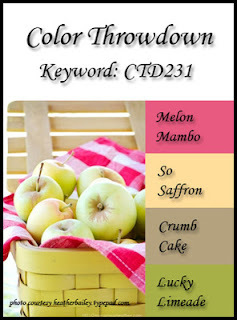 This week's Color Throwdown selections are fabulous! I may decide to make more cards with this dynamic combination! 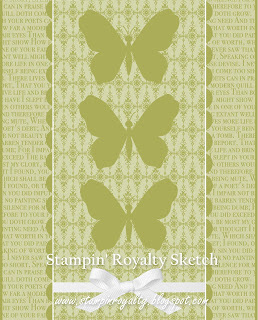 The Stampin' Royalty sketch is equally as dynamic and awesome! I followed the sketch to a "T" and think that the card turned out :) This was the last card in my card making frenzy last night, so my creative light-bulb was dimming. But, none-the-less, I like it for a younger girl's birthday :) I may try these challenges again to give them all the creative justice they deserve though! It's nice to finally be able to showcase one of my lesser used ribbon, the melon mambo dotted ribbon! I learned a trick to tying this type a ribbon in order to have all sides showing dots (the back-side of the ribbon does not have dots). First, tie a loose knot in your main piece of ribbon (the one that goes around the cardstock) and then slip the smaller piece of ribbon ("bow" ribbon) through the loose knot and tighten! Viola, perfect polka dots! (Hope that made sense lol). Thanks for looking and don't forget to stop by tomorrow for this week's KCRR challenge! Your card is so pretty!! I love the layout and the butterflies!! What a pretty card! I love all of the elements and colors you included...a perfect spring card! Love the bright, patterned butterfly trio. Thanks for joining us for this week's Color Throwdown. Beautiful! Love the way you used the colors on this card! Thanks for playing along with us for this weeks Stampin' Royalty Challenge!